the Second Year for Free. Applies to new customers only. 30% off new items through this link. It seems like everyone has a great idea for a new website, but what are you doing about it? Take the first step by reserving your domain and a server by the most trusted website host and name registrar in the world – GoDaddy.com. Join more than 10.5 million satisfied customers and start your website for less by using a Go Daddy coupon code before someone beats you to it. New domain names are becoming scarce. What are you doing to secure yours? More people utilize GoDaddy.com to claim web-space than any other website. Go Daddy currently manages more than 53 million domain names and renews or transfers an additional one every second. Even if you’re not ready to start a website, with Go Daddy’s low prices on new 1, 2, 3, 5, and 10 year registration it makes sense to stake claim to the name now before it’s too late. You can even buy domains in bulk to keep your options open. When you’re ready to take the next step, take advantage of Go Daddy’s hosting solutions to get your site online. Go Daddy has the ability to host and develop websites of any size. For beginners, we recommend the basic Website Builder package that comes complete with over 300 templates to get you started, a built-in Design Wizard to guide you through the design process, and social integration and other widgets to connect with your favorite sites. If you outgrow the basic package, you can upgrade to meet your needs at anytime. More advanced users can select between more robust web hosting services or a server of their own. These powerful systems deliver up to 20 TB of data a month, allow you to work with WordPress, Joomla, Drupal, and other code languages, run CentOS, Fedora, Windows, and other operating systems, and rely on the fastest computers available. Go Daddy truly gives you all the tools to succeed. They even include Bing, Yahoo, and Facebook ad credit when you sign up to start driving traffic to your site immediately. Go Daddy truly is the host with the most! Bob Parsons founded Go Daddy in 1997. Since launching, more than 10.5 million customers have turned to Go Daddy for all their web needs helping to make the site larger than the next eight web registrar companies combined. There is simply no match for GoDaddy.com. As recently as 2012, Go Daddy took home Gold for “Customer Service Department of the Year in Computer Services” from the Stevie Awards, and was named “Best Registrar” by Domain Name Wire’s annual survey racking up nearly half of all votes. Fueled by a creative marketing department and incredible customer service, Go Daddy shows no signs of slowing down. You may not get Danica Patrick on the phone, but Customer Service representatives are available around the clock 24/7/365 to help with all your needs and keep your site running faster than an Indy Car. Go Daddy may register more domain names than anyone online, but there’s just one you need to remember to get your website started. Visit GoDaddy.com and lay claim to your domain. 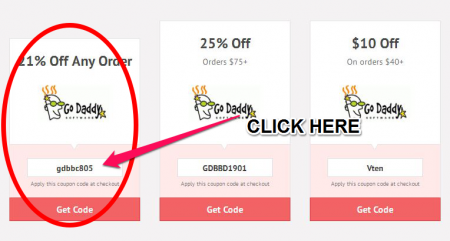 When you do, be sure to take advantage of our exclusive Go Daddy coupon codes to get the best price on the most trusted web hosting and domain registration around. There are a lot of different factors to consider when buying a domain name or improving your business with web design. For purposes of coupon codes let us consider the most frequently asked questions at GoDaddy.com. What forms of payment does Go Daddy accept? Go Daddy accepts orders from all over the world by credit card, including Visa, MasterCard, American Express, Discover, Diners Club International, and JCB International Credit Cards. Other forms of payment they accept are personal or business checks, PayPal™, Alipay, and Good As Gold. Residents of India may also pay with ATM/Maestro Debit Cards, Net Banking, Cash Cards, and Mobile Payments. Good As Gold is a special program at Go Daddy that allows one to transfer money directly from their bank account. Why am I being charged a Value Added Tax (VAT)? VAT is a type of consumption tax placed on an article at each key stage of production. They are most commonly used in the European Union (EU). Most of the products and services offered by Go Daddy are subject to a VAT. For more information consult the European Commission for the Taxation and Customs Union. If you sign up for the referral program at Go Daddy, you receive 35% off new products when you refer a friend. Each new customer that you send their way equals $5 worth of credit. To qualify they must spend a minimum of $10. What is Round Up For Charity? Round Up For Charity is an option which allows you to donate to a nonprofit of your choice at checkout. The idea is to round up to the nearest dollar and give that amount. Featured charities include the National Breast Cancer Foundation, Hope for Haiti, and the Robotics Education & Competition Foundation. My website has been hacked! Now what? If the security of your website has been compromised, you can contact Go Daddy to activate a lock down. Unfortunately this process takes a number of step such as removing any malware and updating all of your passwords and information. Learn more at Go Daddy. Is there a browser that works best? According to GoDaddy.com, their server works best with Firefox, Chrome, Safari, or Internet Explorer. Can I contact Go Daddy for further assistance? In the US call (480) 505-8877 anytime of the day or night to speak to support. Outside of the US? See the list below. Don’t forget you can also contact them online by logging into your Go Daddy account and creating a support ticket. 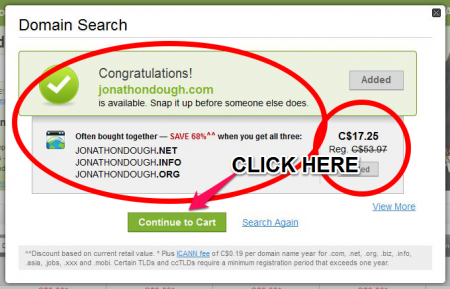 GoDaddy.com usually offers multiple deals and coupon codes. To ensure that you get the lowest price, most of them are automatically applied at checkout. Take this limited time offer for 21% off any order for example. Step 1) Navigate to CouponPal. 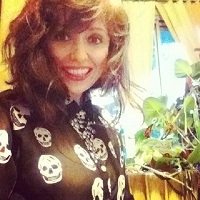 My small business is in desperate need of a website if I want people to take me seriously. Before I invest in bulk domain names for my entrepreneurial ventures, I want to stop by CouponPal to see if there are any applicable coupons or deals. Step 2) Click on the coupon to activate the deal. Apparently GoDaddy.com not only offers discounts, but there are promotions and deals aplenty. 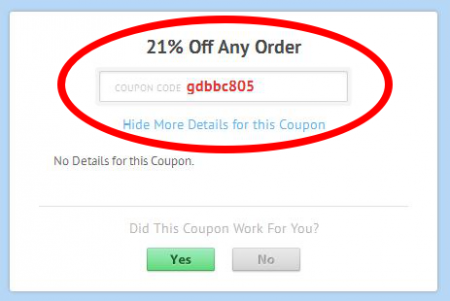 I am particularly interested in this coupon for 21% off of any purchase at GoDaddy.com. I click on the coupon to activate the deal. Step 3) Select your purchase. The name of my new company is Jonathon Doe. Catchy right? To sidestep the competition I am going to acquire all of the URL’s associated with that name, .com, .net, .org, everything. As GoDaddy.com notes, it is like staking a claim on a plot of land in virgin territory. Step 4) Apply the promo code at checkout. Check out is a little different than most stores, because I am going to be paying a reoccuring fee. There is still the little field in the bottom left corner where I can enter a promotional code. I copy and paste (or type) the code, in this case ‘gdbbc805,’ and click apply. Success! As you can tell from the message that pops up, we were getting the lowest price all along. $93 is a bargain compared to all the money Jonathon Dough is sure to make, according to my meticulously drawn up business plan.